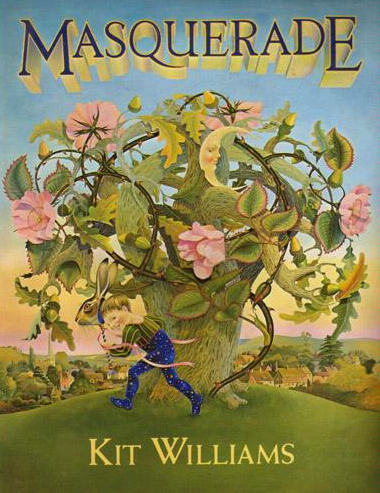 Masquerade is the quintessential armchair treasure hunt book: beautiful to look at and filled with many small, easy puzzles as well as one large one that is nigh impossible to solve. This post goes through some of the little puzzles in the book (as much as can be covered in a single blog post). It also gradually reveals hints to how the main puzzle works, before giving away the full solution. Skip to the end if you want, or try to work it out for yourself once pointed in the right direction. 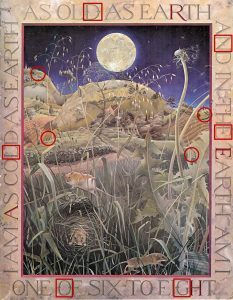 The clues start right on the title page: “To solve the hidden riddle, you must use your eyes, / And find the hare in every picture that may point you to the prize”. Indeed, there is a hare hidden on every page, and hunting them down is the first bit of fun to be had in the book. 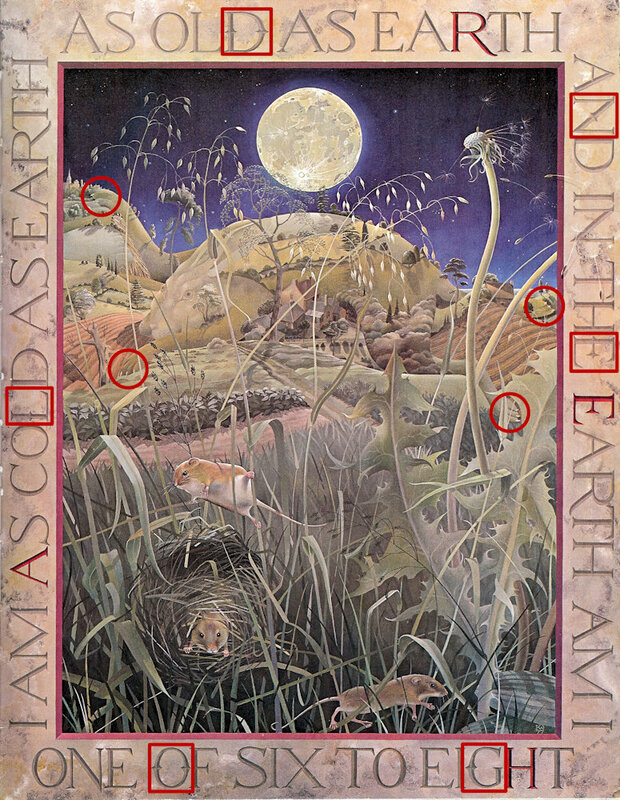 But this clue has two deeper, double meanings: eyes are important, and the hares point, literally, to the answer. A few years after Masquerade‘s hunt for the golden hare came to an end, Kit Williams produced a new puzzle book featuring a golden bee. Having learned from experience that inciting people to dig up England wasn’t a wise move, this time the puzzle was a postal competition: work out the title of the book, represent it artistically and mail it in within the 1 year time limit. Kit chose his favourite solution and awarded the prize of a mahogany box containing a titled copy of the book on a special edition of the Terry Wogan show in 1985. As with Masquerade, the art is gorgeous. 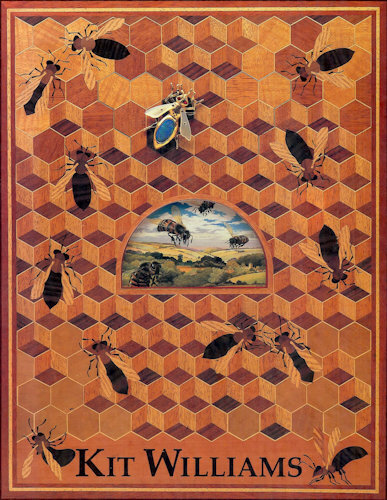 Rather than straight paintings, Kit Williams shows off his marquetry skills with beautiful and imaginative frames, set with gems and carvings. Sometimes, as on the cover, the painting itself is only a tiny part of the whole work. Everything is beautifully photographed to show off how 3-dimensional each piece is. The story is whimsical and timeless, though lacking the quest narrative impact of Masquerade. Published in 1979, it is a glorious work of art filled with visual and textual puzzles and a sweet fairytale story of unrequited love. The unique (at the time) selling point was that the book contained clues to a golden hare that had been buried somewhere in England. A real-life treasure hunt! But I never managed to solve the puzzle and never had the faintest idea where the golden hare might have been buried. It wasn’t until 2005 that I thought to look up the solution on the Internet.